The 23604 was designed to provide full filtration at all times in a race only application. This type of application will use anon-bypass type filter. This does however assume that the filter is changed frequently and that the filter never becomes clogged with contaminants. The 23604 can be used in a street application however it is advisable that the filter be of a bypass type. This is so that if the filter should become full of contaminants (typically more are encountered on the street due to poor air, more carbon build up due to extended idle time and the filter is not changed nearly as often as would be expected in a purpose built race engine) that the oil will bypass the filter and continue to flow through the block thus not over pressurizing the filter. 1. Read all of the Instructions before attempting installation. 2. Remove the oil filter from the engine only if the engine is cool to the touch. 3. Remove the factory (OE) oil filter mount if so equipped. 4. Clean the mounting surface as well as the entire surrounding area to ensure a debris-free environment. 5. Coat both sides of the new O-ring with a thin and uniform film of fresh oil. 6. 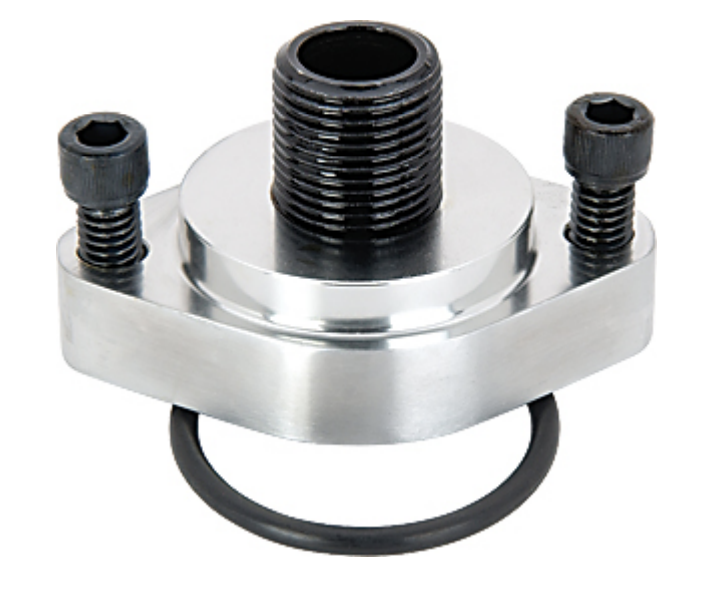 Attach the adapter with the O-ring in place between the adapter and the block by using the 5/16” bolts that are provided. 7. Secure the adapter by tightening the bolts until snug. 8. Apply a thin and uniform film of fresh oil to the gasket on a new oil filter. 9. Install the oil filter onto the adapter by hand tightening the filter to the manufacturer’s specifications. 10. Add the appropriate amount of oil to the engine. 11. Start the engine and inspect for leaks.